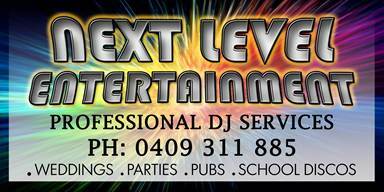 At Next Level Entertainment we know how important your wedding day is and we pride ourselves on specialised entertainment services creating the reception atmosphere you imagined! Highly-experienced and sought after professional musician and DJ. Specialising in weddings, both big and small, he is highly regarded by operators and clients alike for his sensational guitar-playing skills and amazing vocals. Network Disc-Jockeys is a boutique entertainment business specialising in quality DJ's for Weddings and Events, servicing Gold Coast, Brisbane and Sunshine Coast. Multi award winning DJ's with a music library of over 10,000 titles, we can tailor your musical entertainment and special effects for your entire function.